Elaine Perednia has been the owner-operator of The Petsitters since 1984. Before that she was working as a medical technologist at both St. Mary’s Hospital and Pacific Presbyterian Hospital in San Francisco. At that time she had 4 cats and wondered how to find pet care for them when she was on vacation. She thought up the idea of a pet sitting service and found there were only two in San Francisco. 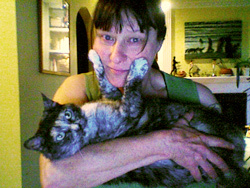 Elaine, loving animals, decided that working full time with pets was the way to go. She started her business and after 6 months was able to quit working at the hospitals. She’s never regretted her decision. In addition to her two Bachelors’ degrees in Biology, one with a concentration in Microbiology, and one in Clinical Science, Elaine has a Master’s degree in Counseling. Elaine handles cats with any medical issues, including injections, sub-q fluids, and tube feeding. The Petsitters is a member of Napps. Read testimonials from our fabulous clients!